With Information Overload from the Map to the Ground, we didn’t aim to explain or reduce the complexity of urbanisation in the 21st century, or of the settlements like Karail Basti, that are such a characteristic, if worrying, part of it. Taking off from the actual ambiguity of the instruments “satellite picture” and “mapping”, applied in an increasing number of studies since the so-called “topographical turn”, we put into practice the radical lesson these settlements teach, which is, to stop counting and start talking with their inhabitants. Searching for words to name what we’re looking at, we were able to grasp these settlements’ and their inhabitants’ own voice. The visualisation, which earned the first prize in the international competition Planetary Urbanism, benefitted from the onsite research efforts of Louisa Scherer, Paul Klever, Farhana Rahman, Anna Sauter, Abdul Kader Khan (Komol), Marian Knop, Lisa Lampe and Tamanna Siddiqui. It will be exhibited during Habitat III in Quito, Ecuador, in October 2016. High fluctuation, insecurity about the future and a state deserting its role on the one hand; self-organisation, practices of resilience and established networks on the other, shape physical outlook and social forms of Karail Basti, a squatter settlement in the heart of Bangladesh’s capital city, Dhaka. To those who are ready to look behind the surface, the basti (don’t call it slum!) 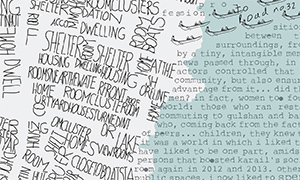 offers an opportunity to reflect on the effects of enduring neglect of structural problems, such as poverty and lacking governance, vis-à-vis the neoliberal promises of “digital futures” and “smart cities”. 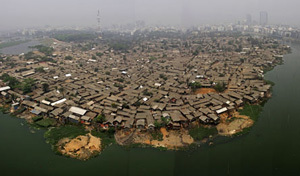 Like in other parts of the world, Bangladesh’s urban poor, subject to consistent politics of exclusion from basic resources, are left no alternative but to occupy, self-organise and negotiate space in order to access housing. 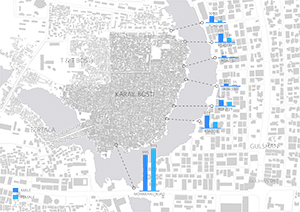 Along with the Bangladesh-based organisations DSK and NDBUS, and with the support of ASA programme, HFB is carrying out a longue durée socio-physical mapping of Dhaka’s biggest spontaneous settlement, Karail Basti. Thanks to repeated interviews with the dwellers and sustained field observation, we are collecting anthropological and sociological knowledge on the basti’s everyday life. A baseline study of the living conditions and living environment in the settlement as well as workshops with selected groups of inhabitants delivered maps that were handed over to the basti dwellers’ organisation in 2012/2013. In 2014, special attention was given to architectural solutions for housing (in-situ upgrading), to the networks that ensure the provision of water, electricity and gas, as well as to emergent spatial phenomena linked to the in-move of new socio-demographic groups. In the remainder of the project (2015-2017), we aim at widening our understanding of the inhabitants’ mental, i.e. cultural representations of the Basti via participant observation, mental maps, sound and video recordings.